BBQ your way through summer in style! Do you love a BBQ? 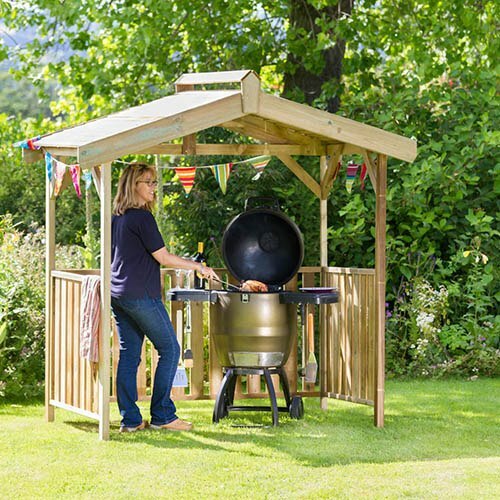 Then the Zest 4 Leisure Ashton BBQ shelter is a must-have for your summer celebration. With an apex roof and panelled sides, this functional yet decorative shelter offers protection for the chef and their guests against light rain - no more soggy sausages or not-so-hot dogs! Suitable for any style garden, the Ashton shelter features pressure treated and FSC® Certified wood and comes with a 10-year guarantee against rot, which means its strong, durable and can be used year after year. The Ashton BBQ Shelter features pressure treated and FSC® Certified wood and comes with a 10-year guarantee against rot, which means its strong, durable and can be used year after year. Dimensions: 2.10m x 1.25m x 2.20m, assembly required - This product is 2-person assembly.